This piece of coco almost gave me a stroke, looked like a critter at first. Just giving her water to drink and spraying with potassium silicate solution. She's cruising right along still causing no real fuss. So far an undemanding plant and needing almost no attention. Happy plant, happy grower. The Gaia Green sure does produce some nice, dark fan leaves. Smells a bit like eggfart sometimes, but anybody with a dog gets "used" to odd odours. When should I raise my lights and how high should they be for the stretch? Using a Meizhi 300 @ about 22" from the canopy right now. Not an easy question to answer because all leds are different. Leds light intensity is measured with a PAR meter measured in umoles.Without one your just guessing.If she starts showing pistils by end of week 4 expect a stretch beginning then into week 5 and possibly beginning of week 6. As your plant grows/blooms you can increase the intensity. You want more intensity when in mid flowering which will be about week 7 for your strain.Did they manufacturer give a min/max distance range? If not keep the light distance about 1-2 inches less than the week before. 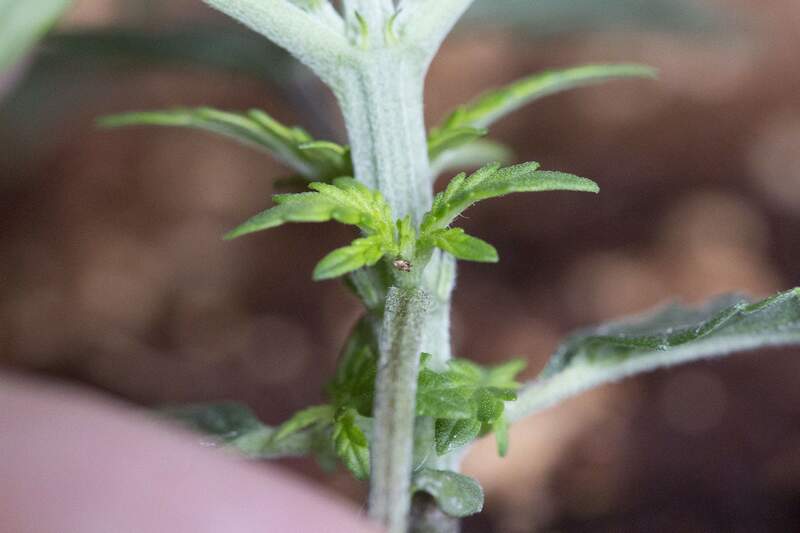 Looking for signs of stress in the leaves closest to the light such as edge curling, changes in color like yellowing, tips browning. Keep in mind the area under the direct center of the light is the most intense. If you LST the main stem to one side this may help prevent the main cola from leaf burn yet still give plenty of light to the lower buds. I would not go any closer than 16-17 inches by week 6-7 to play it safe. Without a PAR meter you'll have to experiment by trial and error. Good luck hopefully someone who has the same light can give you a better idea of distances. Shes looking great so far, nice work! Also trying out my first sweet seed and loving it so far. Best of luck the rest of the way and keep doing what your doing. Be sure to enjoy the journey to come. That’s hysterical and disgusting at once! I dunno about ever getting accustomed to foul odor. I wear a gas mask every time I clean the cat litter! At least dogs go outside!